The term “Royal Residence” brings to mind an amazing world of fantasy. Sleeping Beauty’s Castle is what an American girl grows up with as her vision of what a royal residence really looks like. But the facts are much different from this fairy tale and much more interesting in England. For many decades, even centuries, kings and queens of the United Kingdom have built or bought incredibly diverse palaces to serve as a family home or workplace–or just a little spot to rule from. 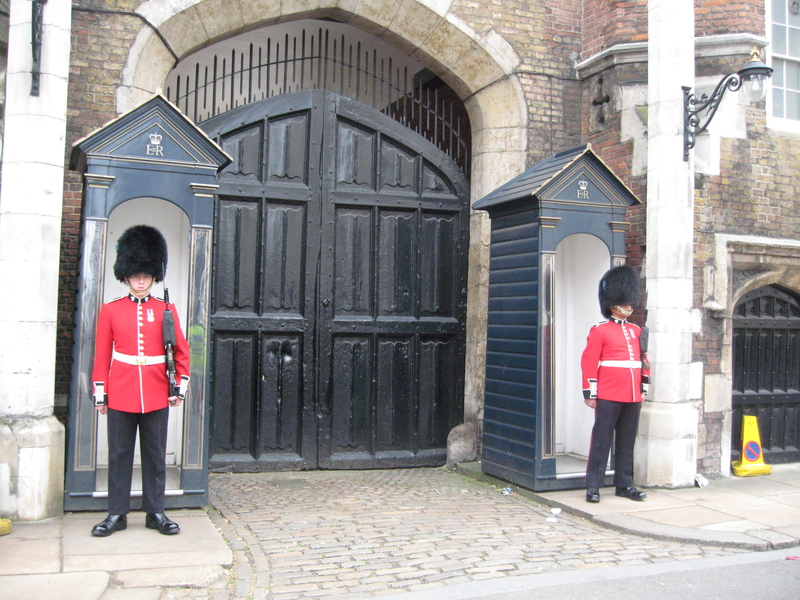 Guarding St. James’s Palace. Photo by me. Royal Residences fall in to three general categories: Official Royal Residences which are held in trust for future generations, Private Estates which are owned by the Queen and can be private residences for the Queen and her family or may generate income, and Unoccupied Royal Residences which are all other buildings in Great Britain which once housed members of the Royal Family and therefore may be of historical interest. Sandringham, the Queen’s estate in Norfolk, England. Photo by me. We have seen many of these incredible palaces and estates on our travels throughout Great Britain, but it might be fun to revisit them here. Some are open to the public, some only allow their gardens to be viewed at certain times of the year, and many of the official residences are used for receptions, investitures, banquets and garden parties. 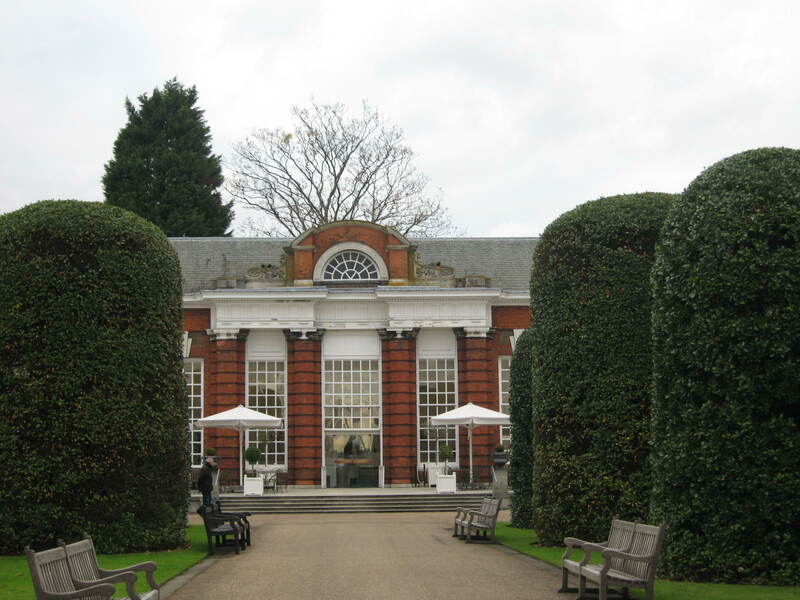 A lovely place to get some lunch just across the garden from Kensington Palace. Photo by me. Then there are the private residences, used by the Royal Family for generations. 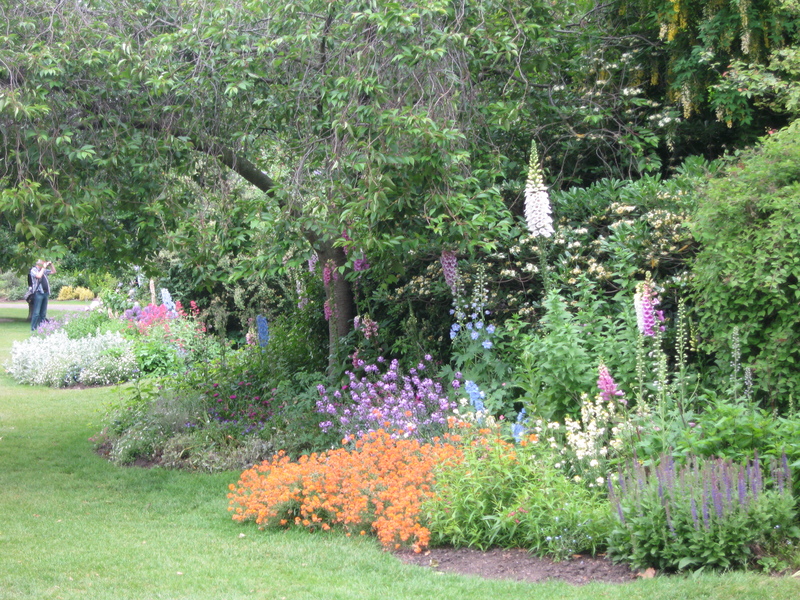 These, too, are sometimes available to see, at least from the outside gardens. 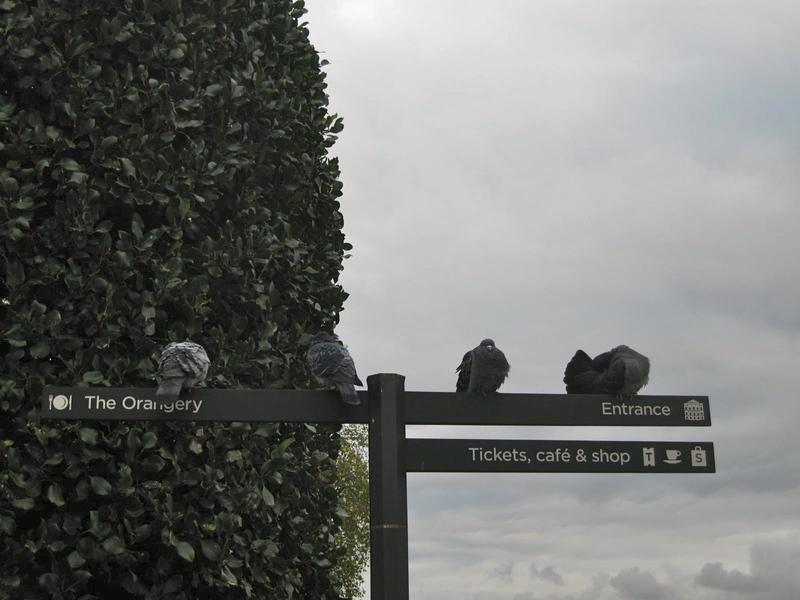 Some feathered visitors waiting outside Kensington Palace in London. Photo by me. Thanks to the official website of the British Monarchy, I was able to recall all that I had seen, and discover a few I’ve missed. Next visit, maybe. Certainly BP is one of the most familiar Royal Residences from viewing years of public events on television. We actually went on a tour of the Palace on one of our first trips together to London. My Beloved Brit had never been inside, and found it fascinating and familiar from all the news footage of the famous residence. 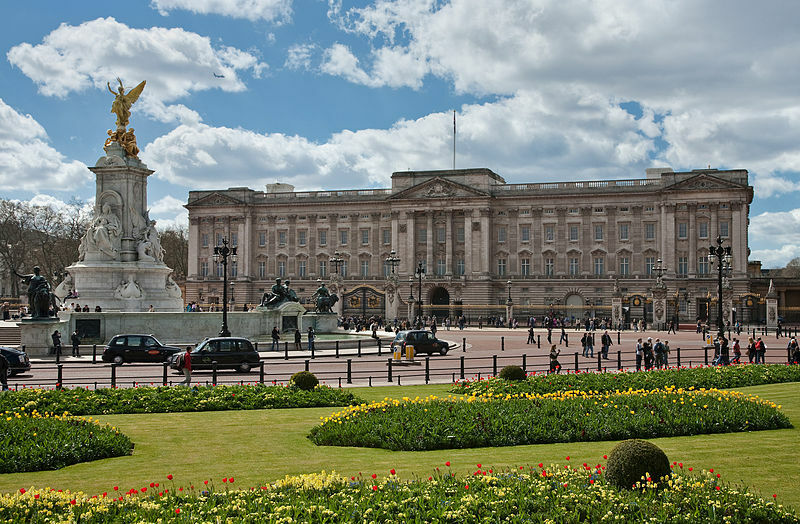 The Palace, all 775 rooms of it, has served as the official London residence of Britain’s sovereigns since 1837 and today is the administrative headquarters of Queen Elizabeth II. For information on planning a visit see The Royal Collection website. Just as an aside, there are 52 Royal and guest bedrooms, and 188 staff bedrooms. Oh my! Windsor Castle was one of the first of the Royal Residences that My Beloved Brit and I ever visited together. It is quite near Heathrow, and the city of Windsor is a good last stopping point before heading to the airport to come home. The Castle itself is very imposing (it is the largest occupied castle in the world!) and right in city center so great to walk to and view. 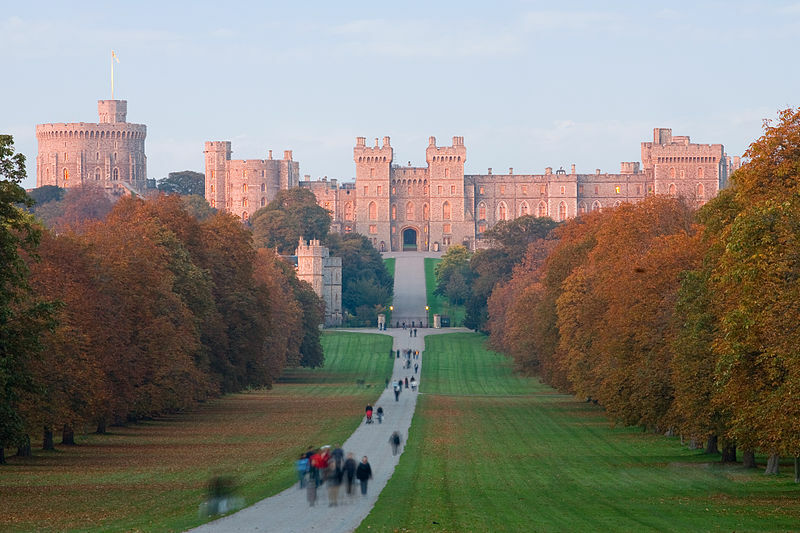 Windsor has been a Royal home and fortress for over 900 years and still is an active residence today. The Queen usually uses Windsor as a private home, escaping from London on the weekends, but it is also used for more formal duties. Every Easter, the Queen takes up official residence for a month–Easter Court. Many parts of the Castle are open to the public. For more information, check here. I think this was one of my personal favorites. 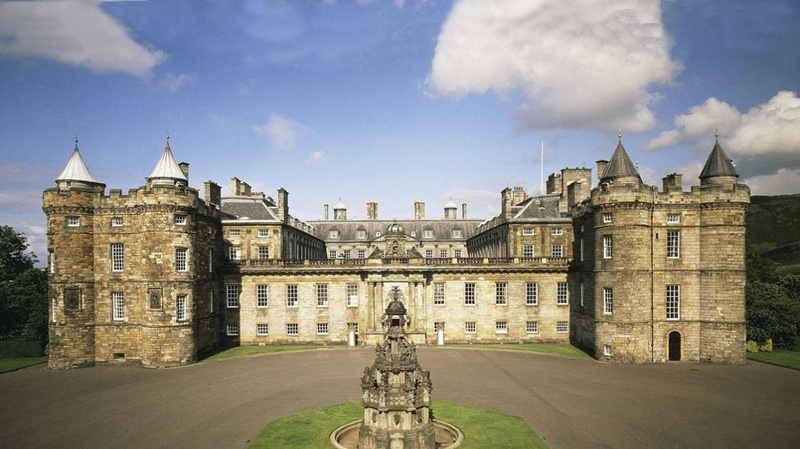 I love Edinburgh anyway, and Holyroodhouse has such a strong sense of history. There is so much to see, and much of it seems unchanged from the 1500s. The Queen’s official residence in Scotland, the Palace is closely associated with Mary Queen of Scots, who lived here between 1561 and 1567. You can almost feel the court intrigue and drama. I half expected to see blood on the floor. For visitor information, see here. 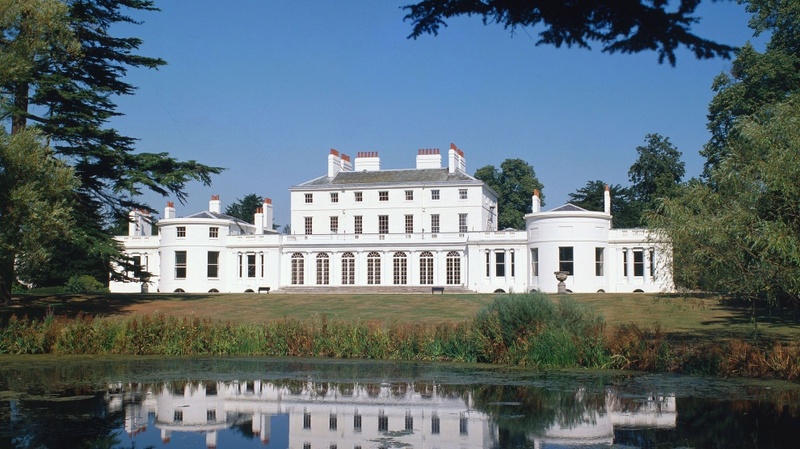 I have never seen Frogmore House, which is no longer a royal residence, but the house and gardens are sometimes used for official receptions or gatherings hosted by the Royal Family. Frogmore is located on the grounds of Windsor Castle. It is most closely associated with Queen Victoria, and was one of her favorite retreats. In the gardens is the Mausoleum where Queen Victoria and Prince Albert are buried. Check here for visitor information. Balmoral in June. Photo by me. 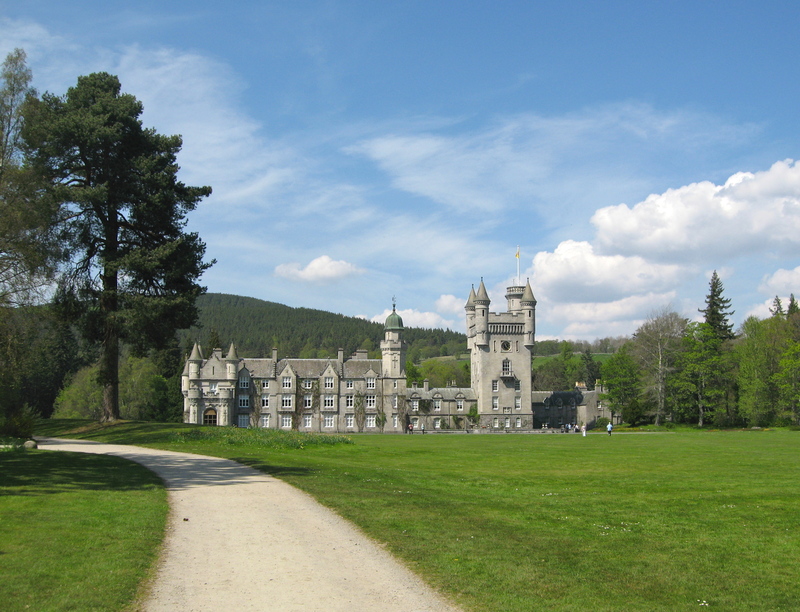 We visited Balmoral in Early June last year, and were shocked to find warm balmy weather…in Scotland!…in June! But we were thrilled. 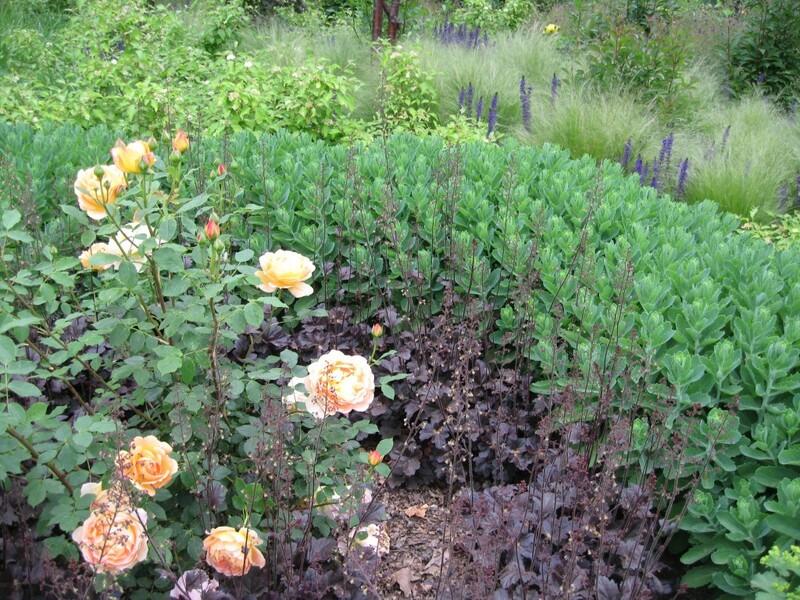 The gardens were active and blooming early that year. You can walk around the gardens, the stable exhibitions and the ballroom at Balmoral, but not actually through the Castle. That was fine. The grounds are magnificent. Located in Aberdeenshire, Scotland, it is the private residence of the Queen who spends her summer family holiday there every August. Visit the Balmoral website. 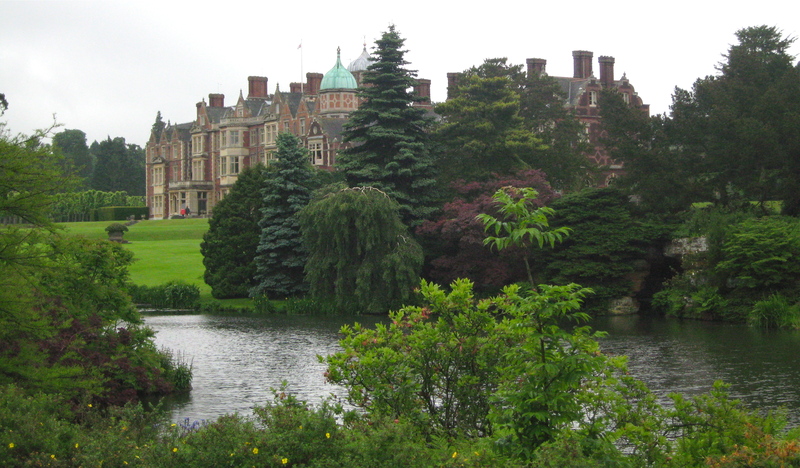 Sandringham House in June. The grounds are as lovely as the house. Photo by me. 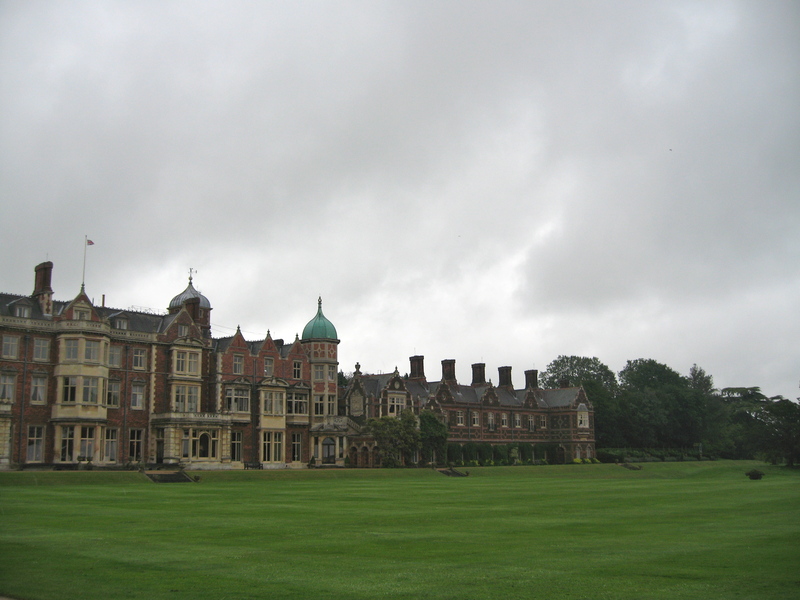 This lovely sprawling house on a charming estate is in Norfolk in Eastern England, and we got to visit it last summer. It has been the private home of Sovereigns since 1862. The Queen and members of the Royal Family spend Christmas at Sandringham, and you can walk the grounds as they do each year, strolling from the grand main house to the small church where they attend Christmas services. We were able to tour the grounds and gardens, a large museum and exhibition in the stable block which had an extensive car collection, as well as walk through the main level of the house. We could even gaze at the table where the Queen works on her crossword puzzles. It was all very intimate and warm. For information on times when you can visit the residence, check here. 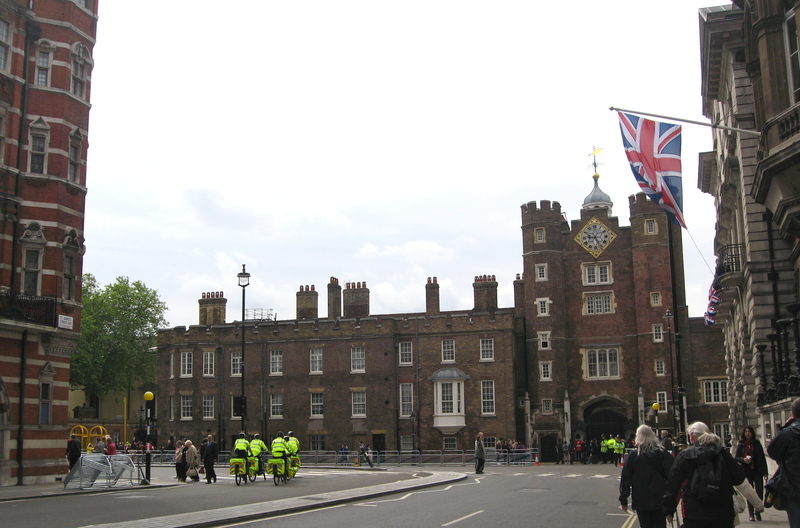 St James’s Palace during Jubilee Week. Photo by me. This historic palace is not open to the public, but when we stay in London at My Beloved Brit’s sailing club, we pass it every day on our way to the Mall and other parts of London. It is home to several members of the Royal Family and their household offices. One of London’s oldest palaces, it is just north of St. James’s Park. It was originally commissioned by Henry VIII and constructed between 1531 and 1536 in red-brick Tudor style around four courtyards. 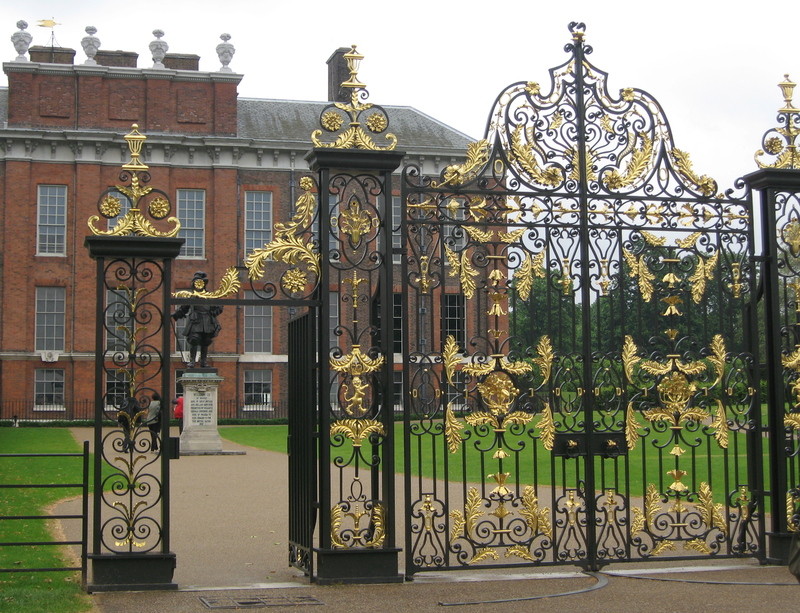 The Gates at Kensington Palace. Photo by me. The home of several members of the Royal Family, one of the most interesting and exciting facts of KP is that the Duke and Duchess of Cambridge (Will & Kate) who currently live there and are in the process of renovating the much larger apartment that used to be Princess Margaret’s. Hopefully all will be done in time for the arrival of baby Prince or Princess, but word has it the renovation may not be ready until the autumn. I love Kensington Palace and one section of it reopened to the public just a couple of years ago. It has incredibly well done exhibitions of Royal Apartments, Queen Victoria’s romance with Prince Albert, and special displays. It also has a marvelous tea shop attached to the gift shop, where you can find a quiet reprieve from a day of touring. For information on visiting, check here. 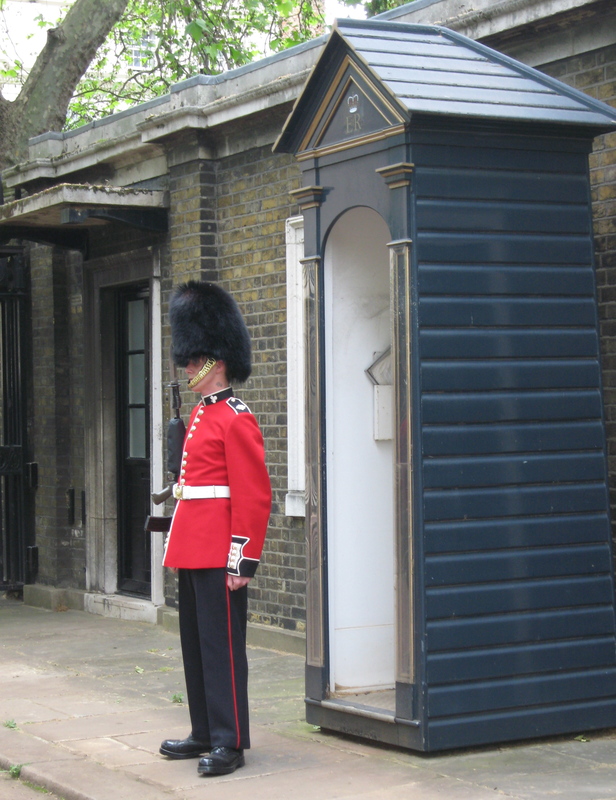 Standing Guard outside of Clarence House. Photo by me. 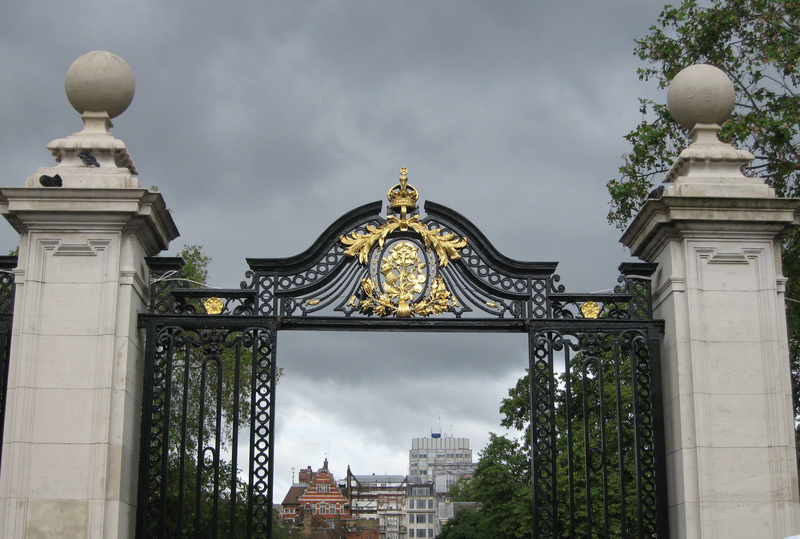 I actually saw the Queen Mother exiting through the London gates of Clarence House on my very first visit ever to London…even before I knew My Beloved Brit even existed. I think that hooked me on GB Royal Tradition. Everyone lining The Mall stopped and waved as she waved back through the car window. It was her home from 1953 until 2002. Clarence House is still on my list to visit, and I am hoping perhaps this summer I may be able to check it off. 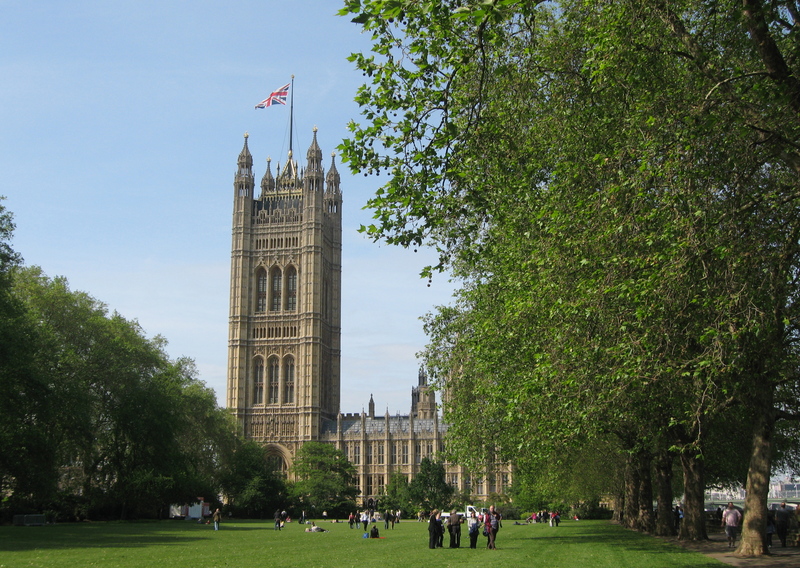 It stands right beside St. James’s Palace on The Mall and was built between 1825 and 1827. It is now the Official residence of The Prince of Wales and the Duchess of Cornwall and is open to the public during the summer months each year. Although it was closed last summer, because of the logistics of the Olympic Games in London, it will re-open summer 2013. For information, check here. Unoccupied Royal Residences There are many buildings throughout Great Britain that have a Royal connection. 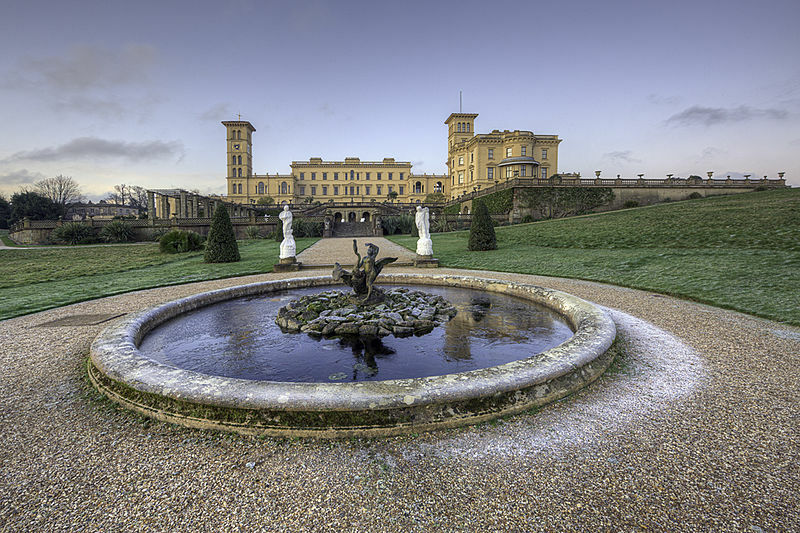 Some, like Osborne House, the much-loved home of Queen Victoria and Prince Albert on the Isle of Wight, The Brighton Pavillion, a former residence of George IV when he was Prince Regent, Hampton Court Palace (home of Henry VII), and The Tower of London where the Crown Jewels can be seen. For more information on these, and other unoccupied Royal residences, click here. I won’t go in to any more detail here, but if you have time, explore The Royal Residences of Great Britain preferably in person, but, if nothing else, online. It gives such a wonderful picture of the United Kingdom’s Monarchy and the rich history of the country. Happy exploring. 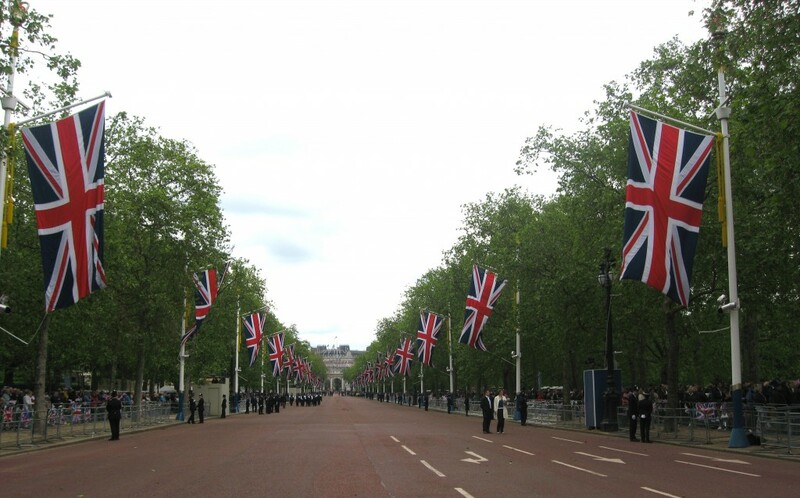 I spent a great deal of time in St. James’s Park on Jubilee Weekend because of its proximity to Buckingham Palace and The Mall where many of the regal activities took place. 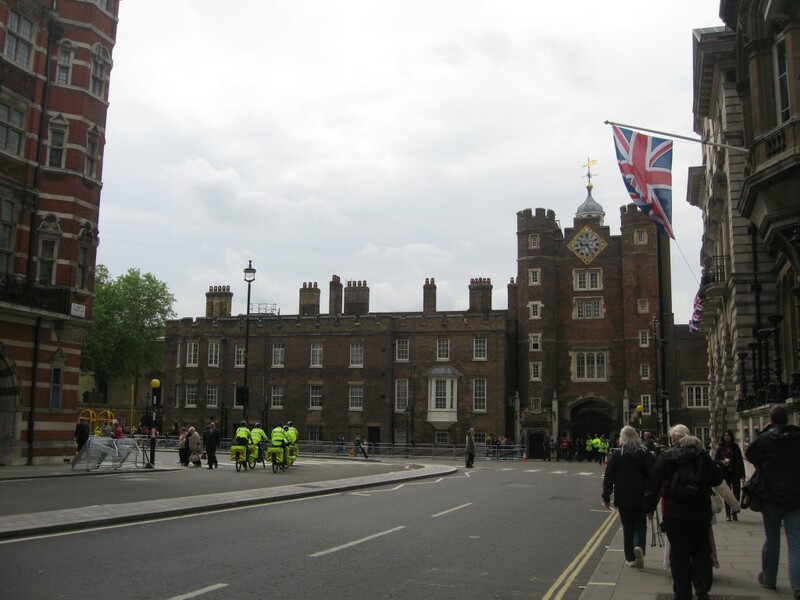 Skirted by three royal palaces–the ancient Palace of Westminster (now known as The Houses of Parliament), the Tudor styled St. James’s Palace, and Buckingham Palace where the Monarch has lived since 1837–St. 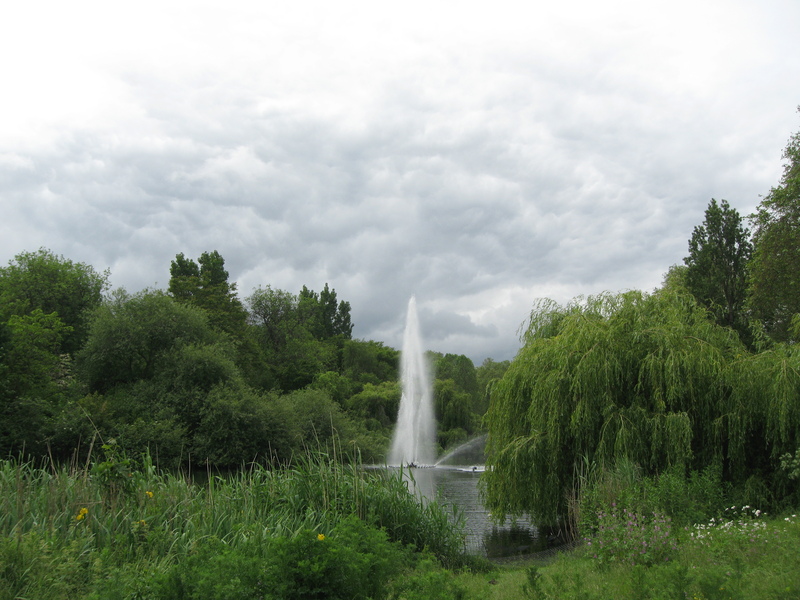 James’s Park is located in the heart of historic London. 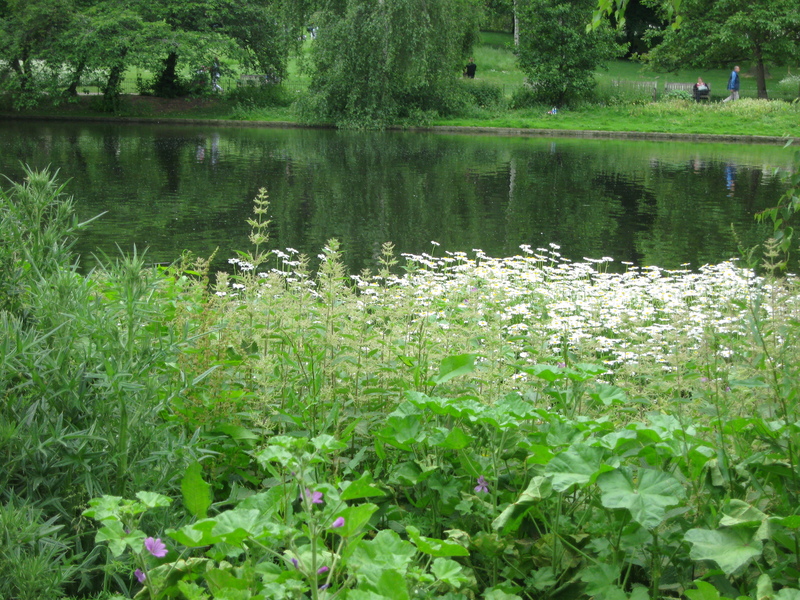 It is also one of the most beautiful parks in the city. In 1536, King Henry VIII decided to turn the marshy farmland and woods into a deer park conveniently located near his palace at Westminster. 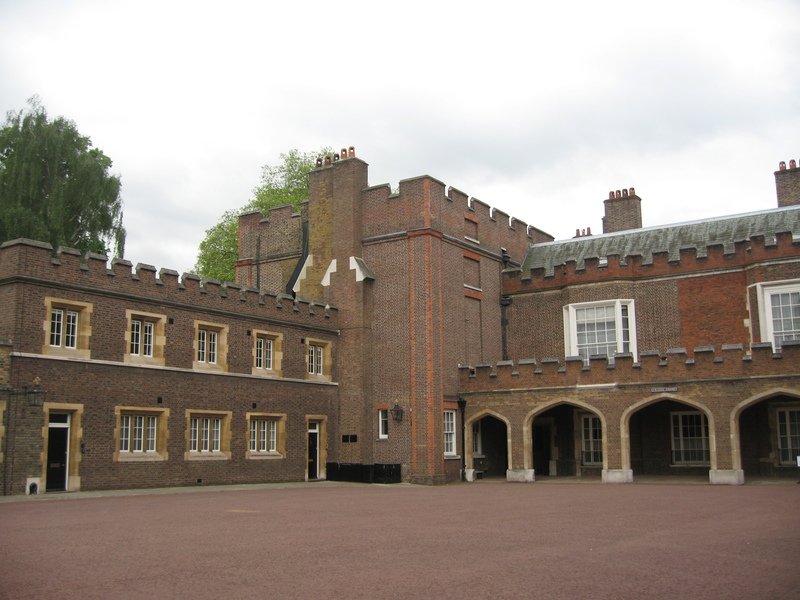 He acquired the land and eventually built a hunting lodge on it which finally became St. James’s Palace. St. Jame’s Palace is just around the corner from The Ritz on a busy London Street during Jubilee. Photo by me. St. Jame’s Palace borders two worlds, the park and The Mall on one side, and a busy London Street on the other. The side of St. James’s Palace backs up to St. Jame’s Park. The Palace is still an active court. Photo by me. 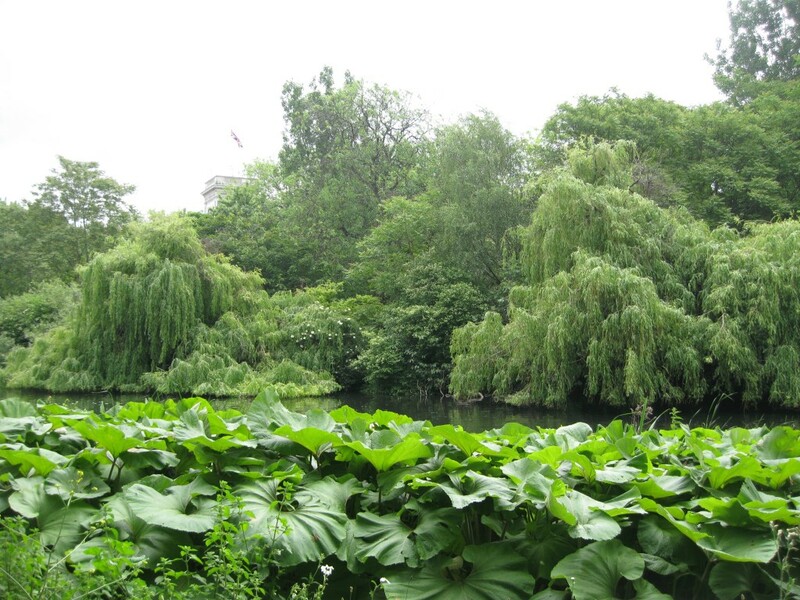 After many reincarnations, the park got another makeover in the 1820s in the naturalistic style when George IV did a major renovation project creating many of London’s best-known landmarks, including Regent’s Park and The Mall as a grand boulevard. It was overseen by landscaper and architect, John Nash. His design is pretty much as you see the park today. It was designed by John Nash in a natural style. Photo by me. 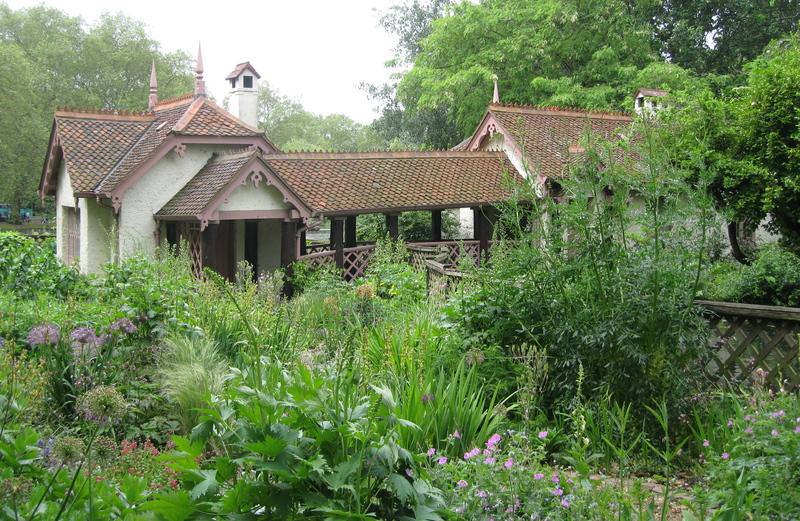 A small cottage on the south edge of the park was the bird-keeper’s cottage built in 1841. Photo by me. 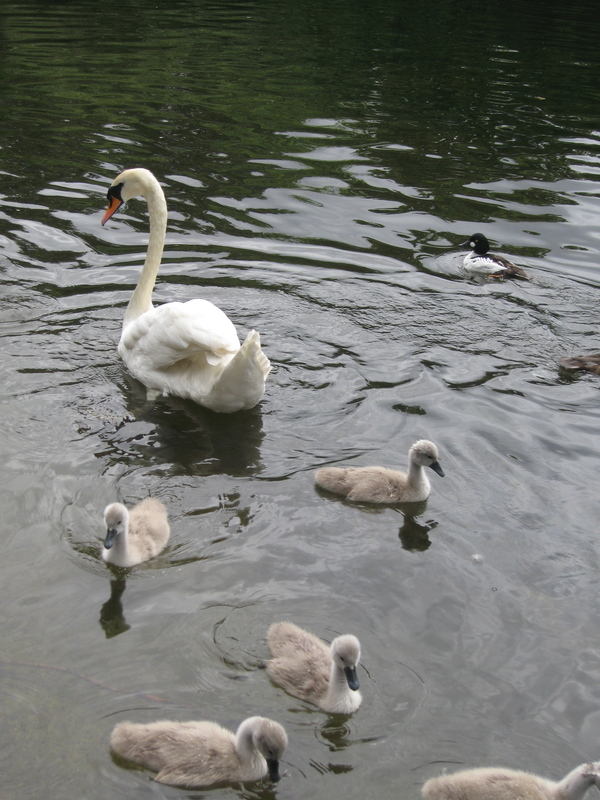 …and seeing the amazing collection of wildlife. With over 5.5 million visitors a year it is amazing that the habitat survives. 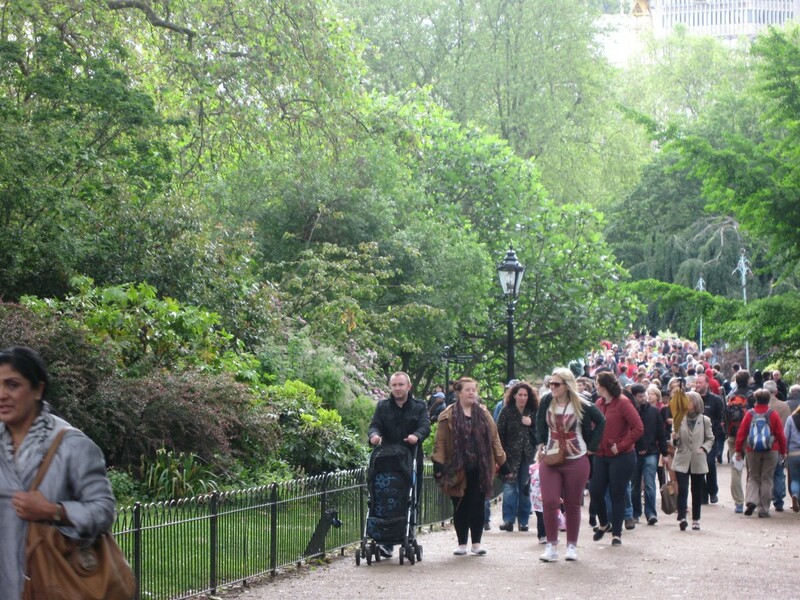 The park is very well used, especially on bank holiday weekends. Photo by me. But survive it does, and flourishes. 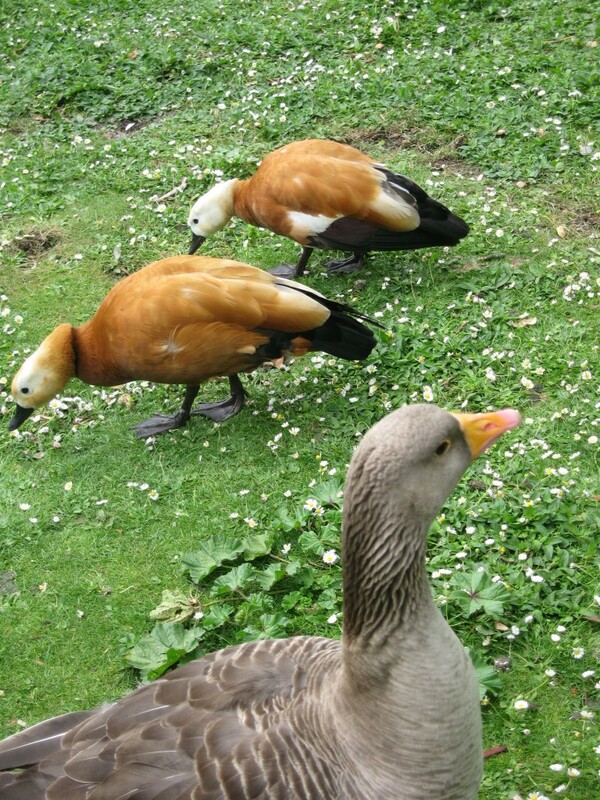 There are over 15 different species of waterfowl in the park. 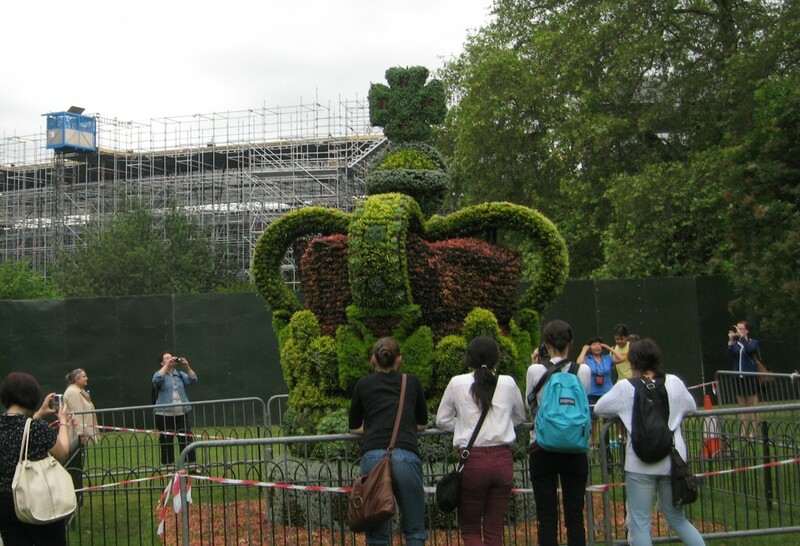 To commemorate the Queen’s Diamond Jubilee, The Royal Parks fashioned a magnificent crown which is a floral replica of the St. Edwards Crown that was used in the crowning of Queen Elizabeth II during her coronation ceremony on 2 June 1953. The Royal Parks Jubilee Crown. Photo by me. I could have spent many more hours just getting to know the park a little bit better. It makes me want to return for a sketching day along the lake. For more information on the Park, visit their website with a click here. 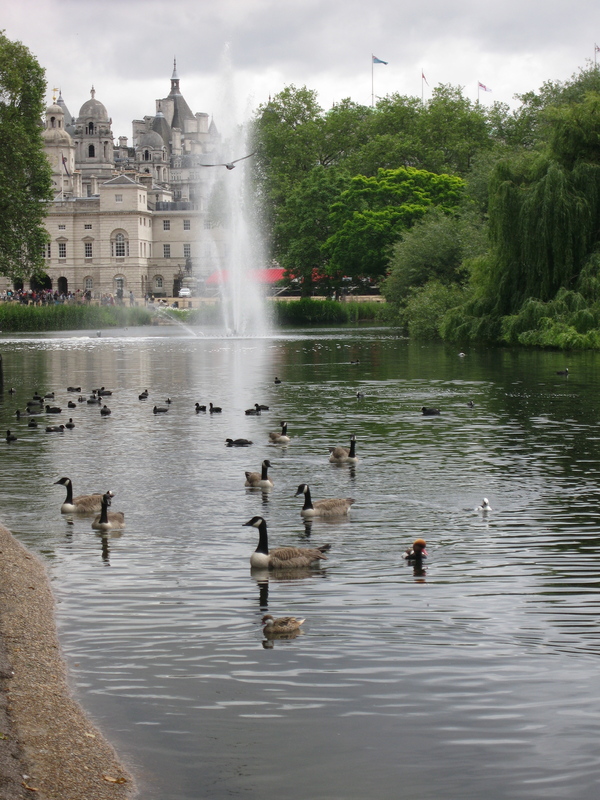 The lake at St. Jame’s Park looking towards the Horse Guards Parade off Whitehall. Photo by me.